Each year, larger numbers of homeless people live in the streets of modern cities. These people may be jobless workers, battered women, the untreated mentally ill, or simply those too poor to get by. They tend to be "invisible" to the rest of society, but they are a real presence of Christ, the Suffering Servant, in history. 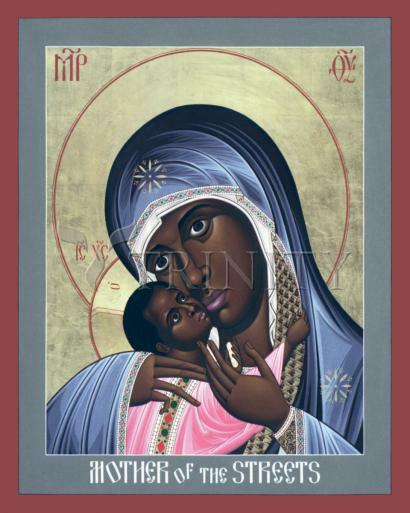 This icon depicts the Mother of God as the mother of those on the streets. Her garments, and those of her Son, are covered with jewels and gold decoration, making manifest the hidden worth and dignity of street people, who are living icons of God. In 1984 the Catholic bishops of the U.S. declared, "To turn aside from those on the margins of society, the needy and the powerless, is to turn aside from Jesus. Such people show His face to the world." Such people are also a presence of Church, for where Christ is, there is His Church. Two trends are largely responsible for the rise in homelessness over the past 20-25 years: a growing shortage of affordable rental housing and a simultaneous increase in poverty. Below is an overview of current poverty and housing statistics, as well as additional factors contributing to homelessness. Homelessness and poverty are inextricably linked. Poor people are frequently unable to pay for housing, food, childcare, health care, and education. Difficult choices must be made when limited resources cover only some of these necessities. Often it is housing, which absorbs a high proportion of income, that must be dropped. Being poor means being an illness, an accident, or a paycheck away from living on the streets. In 2000, 11.3% of the U.S. population, or 31.1 million people, lived in poverty (U.S. Bureau of the Census, 2001). While the number of poor people has decreased a bit in recent years, the number of people living in extreme poverty has increased. In 2000, 39% of all people living in poverty had incomes of less than half the poverty level. This statistic remains unchanged from the 1999 level. Forty percent of persons living in poverty are children; in fact, the 2000 poverty rate of 16.2% for children is significantly higher than the poverty rate for any other age group. Media reports of a growing economy and low unemployment mask a number of important reasons why homelessness persists, and, in some areas of the country, is worsening. These reasons include stagnant or falling incomes and less secure jobs which offer fewer benefits. While the last few years have seen growth in real wages at all levels, these increases have not been enough to counteract a long pattern of stagnant and declining wages. Low-wage workers have been particularly hard hit by wage trends and have been left behind as the disparity between rich and poor has mushroomed. To compound the problem, the real value of the minimum wage in 1997 was 18.1% less than in 1979 (Mishel, Bernstein, and Schmitt, 1999). Although incomes appear to be rising, this growth is largely due to more hours worked -- which in turn can be attributed to welfare reform and the tight labor markets. Factors contributing to wage declines include a steep drop in the number and bargaining power of unionized workers; erosion in the value of the minimum wage; a decline in manufacturing jobs and the corresponding expansion of lower-paying service-sector employment; globalization; and increased nonstandard work, such as temporary and part-time employment (Mishel, Bernstein, and Schmitt, 1999). Declining wages, in turn, have put housing out of reach for many workers: in every state, more than the minimum wage is required to afford a one or two-bedroom apartment at Fair Market Rent. In fact, in the median state a minimum-wage worker would have to work 89 hours each week to afford a two-bedroom apartment at 30% of his or her income, which is the federal definition of affordable housing (National Low Income Housing Coalition, 2001). Currently, 5 million rental households have "worst case housing needs," which means that they pay more than half their incomes for rent, living in severely substandard housing, or both. The primary source of income for 80% of these households is earnings from jobs. In 1998, this was the case for only 40% of households with worst case housing needs. This represents a 40% increase in working households with worst case housing needs from 1995 to 1999 (U.S. Housing and Urban Development, 2001). The connection between impoverished workers and homelessness can be seen in homeless shelters, many of which house significant numbers of full-time wage earners. A survey of 27 U.S. cities found that over one in four people in homeless situations are employed, a significant increase from 1998 (U.S. Conference of Mayors, 2000). In a number of cities not surveyed by the U.S. Conference of Mayors - as well as in many states -- the percentage is even higher (National Coalition for the Homeless, 1997). The future of job growth does not appear promising for many workers: a 1998 study estimated that 46% of the jobs with the most growth between 1994 and 2005 pay less than $16,000 a year; these jobs will not lift families out of poverty (National Priorities Project, 1998). Moreover, 74% of these jobs pay below a livable wage ($32,185 for a family of four). Thus, for many Americans, work provides no escape from poverty. The benefits of economic growth have not been equally distributed; instead, they have been concentrated at the top of income and wealth distributions. A rising tide does not lift all boats, and in the United States today, many boats are struggling to stay afloat. The declining value and availability of public assistance is another source of increasing poverty and homelessness. Until its repeal in August 1996, the largest cash assistance program for poor families with children was the Aid to Families with Dependent Children (AFDC) program. Between 1970 and 1994, the typical state's AFDC benefits for a family of three fell 47%, after adjusting for inflation (Greenberg and Baumohl, 1996). The Personal Responsibility and Work Opportunity Reconciliation Act of 1996 (the federal welfare reform law) repealed the AFDC program and replaced it with a block grant program called Temporary Assistance to Needy Families (TANF). Current TANF benefits and Food Stamps combined are below the poverty level in every state; in fact, the median TANF benefit for a family of three is approximately one-third of the poverty level. Thus, contrary to popular opinion, welfare does not provide relief from poverty. Welfare caseloads have dropped sharply since the passage and implementation of welfare reform legislation. In the Institute for Children and Poverty study, 37% of homeless families had their welfare benefits reduced or cut in the last year. More strikingly, in Bucks Country and Philadelphia, PA, and Seattle, WA, more than 50% had their benefits reduced or cut… Among those who lost their benefits, 20% said they became homeless as a direct result. Additionally, a second study of six states found that between 1997 and 1998, 25% of families who had stopped receiving welfare in the last six months doubled-up on housing to save money, and 23% moved because they could not pay rent. (Institute for Children and Poverty, 2001). Moreover, extreme poverty is growing more common for children, especially those in female-headed and working families. This increase can be traced directly to the declining number of children lifted above one-half of the poverty line by government cash assistance for the poor (Children's Defense Fund and the National Coalition for the Homeless, 1998). As a result of loss of benefits, low wages, and unstable employment, many families leaving welfare struggle to get medical care, food, and housing. Many lose health insurance, despite continued Medicaid eligibility: a recent study found that 675,000 people lost health insurance in 1997 as a result of the federal welfare reform legislation, including 400,000 children (Families USA, 1999). Moreover, over 725,000 workers, laid off from their jobs due to the recession this past year, lost their health insurance. (Families USA, 2001). In addition, housing is rarely affordable for families leaving welfare for low wages, yet subsidized housing is so limited that fewer than one in four TANF families nationwide lives in public housing or receives a housing voucher to help them rent a private unit. For most families leaving the rolls, housing subsidies are not an option. In some communities, former welfare families appear to be experiencing homelessness in increasing numbers (Children's Defense Fund and the National Coalition for the Homeless, 1998). In addition to the reduction in the value and availability of welfare benefits for families, recent policy changes have reduced or eliminated public assistance for poor single individuals. Several states have cut or eliminated General Assistance (GA) benefits for single impoverished people, despite evidence that the availability of GA reduces the prevalence of homelessness (Greenberg and Baumohl, 1996). People with disabilities, too, must struggle to obtain and maintain stable housing. In 1998, on a national average, a person receiving Supplemental Security Income (SSI) benefits had to spend 69% of his or her SSI monthly income to rent a one-bedroom apartment at Fair Market Rent; in more than 125 housing market areas, the cost of a one-bedroom apartment at Fair Market Rent was more than a person's total monthly SSI income (Technical Assistance Collaborative & the Consortium for Citizens with Disabilities Housing Task Force, 1999). Presently, most states have not replaced the old welfare system with an alternative that enables families and individuals to obtain above-poverty employment and to sustain themselves when work is not available or possible. A lack of affordable housing and the limited scale of housing assistance programs have contributed to the current housing crisis and to homelessness. The gap between the number of affordable housing units and the number of people needing them has created a housing crisis for poor people. Between 1973 and 1993, 2.2 million low-rent units disappeared from the market. These units were either abandoned, converted into condominiums or expensive apartments, or became unaffordable because of cost increases. Between 1991 and 1995, median rental costs paid by low-income renters rose 21%; at the same time, the number of low-income renters increased. Over these years, despite an improving economy, the affordable housing gap grew by one million (Daskal, 1998). Between 1970 and 1995, the gap between the number of low-income renters and the amount of affordable housing units skyrocketed from a nonexistent gap to a shortage of 4.4 million affordable housing units - the largest shortfall on record (Institute for Children and Poverty, 2001). More recently, the strong economy has caused rents to soar, putting housing out of reach for the poorest Americans. Between 1995 and 1997, rents increased faster than income for the 20% of American households with the lowest incomes (U.S. Department of Housing and Urban Development, 1999). This same study found that the number of housing units that rent for less than $300, adjusted for inflation, declined from 6.8 million in 1996 to 5.5 million in 1998, a 19 percent drop of 1.3 million units. The loss of affordable housing puts even greater numbers of people at risk of homelessness. The lack of affordable housing has lead to high rent burdens (rents which absorb a high proportion of income), overcrowding, and substandard housing. These phenomena, in turn, have not only forced many people to become homeless; they have put a large and growing number of people at risk of becoming homeless. A recent Housing and Urban Development (HUD) study found that 4.9 million unassisted, very low-income households - this is 10.9 million people, 3.6 million of whom are children -- had "worst case needs" for housing assistance in 1999 (U.S. Department of Housing and Urban Development, 2001). Although this figure seems to be a decrease from 1997, it is misleading since, in the same two-year span, "the number of units affordable to extremely low-income renters dropped between 1997 and 1999 at an accelerated rate, and shortages of housing both affordable and available to these renters actually worsened (HUD Report on Worst Case Housing Needs, 1999). Housing assistance can make the difference between stable housing, precarious housing, or no housing at all. However, the demand for assisted housing clearly exceeds the supply: only about one-third of poor renter households receive a housing subsidy from the federal, state, or a local government (Daskal, 1998). The limited level of housing assistance means that most poor families and individuals seeking housing assistance are placed on long waiting lists. From 1996-1998, the time households spent on waiting lists for HUD housing assistance grew dramatically. For the largest public housing authorities, a family's average time on a waiting list rose from 22 to 33 months from 1996 to 1998 - a 50% increase (U.S. Department of Housing and Urban Development, 1999). The average waiting period for a Section 8 rental assistance voucher rose from 26 months to 28 months between 1996 and 1998. Excessive waiting lists for public housing mean that people must remain in shelters or inadequate housing arrangements longer. For instance, in the mid-1990s in New York, families stayed in a shelter an average of five months before moving on to permanent housing. Today, the average stay is nearly a year (Santos, 2002). Consequently, there is less shelter space available for other homeless people, who must find shelter elsewhere or live on the streets. A housing trend with a particularly severe impact on homelessness is the loss of single room occupancy (SRO) housing. In the past, SRO housing served to house many poor individuals, including poor persons suffering from mental illness or substance abuse. From 1970 to the mid-1980s, an estimated one million SRO units were demolished (Dolbeare, 1996). The demolition of SRO housing was most notable in large cities: between 1970-1982, New York City lost 87% of its $200 per month or less SRO stock; Chicago experienced the total elimination of cubicle hotels; and by 1985, Los Angeles had lost more than half of its downtown SRO housing (Koegel, et al, 1996). From 1975 to 1988, San Francisco lost 43% of its stock of low-cost residential hotels; from 1970 to 1986, Portland, Oregon lost 59% of its residential hotels; and from 1971 to 1981, Denver lost 64% of its SRO hotels (Wright and Rubin, 1997). Thus the destruction of SRO housing is a major factor in the growth of homelessness in many cities. Finally, it should be noted that the largest federal housing assistance program is the entitlement to deduct mortgage interest from income for tax purposes. In fact, for every one dollar spent on low income housing programs, the federal treasury loses four dollars to housing-related tax expenditures, 75% of which benefit households in the top fifth of income distribution (Dolbeare, 1996). Moreover, in 1994 the top fifth of households received 61% of all federal housing benefits (tax and direct), while the bottom fifth received only 18%. Thus, federal housing policy has not responded to the needs of low-income households, while disproportionately benefiting the wealthiest Americans. Lack of Affordable Health Care: For families and individuals struggling to pay the rent, a serious illness or disability can start a downward spiral into homelessness, beginning with a lost job, depletion of savings to pay for care, and eventual eviction. In 2000, approximately 38.7 million Americans had no health care insurance (U.S. Bureau of the Census, 1998b). Nearly a third of persons living in poverty had no health insurance of any kind. The coverage held by many others would not carry them through a catastrophic illness. Domestic Violence: Battered women who live in poverty are often forced to choose between abusive relationships and homelessness. In a study of 777 homeless parents (the majority of whom were mothers) in ten U.S. cities, 22% said they had left their last place of residence because of domestic violence (Homes for the Homeless, 1998). In additions, 34% of cities surveyed by the U.S. Conference of Mayors identified domestic violence as a primary cause of homelessness (U.S. Conference of Mayors, 1998). Studying the entire country, though, reveals that the problem is even more serious. Nationally, approximately half of all women and children experiencing homelessness are fleeing domestic violence (Zorza, 1991; National Coalition Against Domestic Violence, 2001). Mental Illness: Approximately 22% of the single adult homeless population suffers from some form of severe and persistent mental illness (U.S. Conference of Mayors, 2001). Despite the disproportionate number of severely mentally ill people among the homeless population, increases in homelessness are not attributable to the release of severely mentally ill people from institutions. Most patients were released from mental hospitals in the 1950s and 1960s, yet vast increases in homelessness did not occur until the 1980s, when incomes and housing options for those living on the margins began to diminish rapidly. According to the Federal Task Force on Homelessness and Severe Mental Illness, only 5-7% of homeless persons with mental illness need to be institutionalized; most can live in the community with the appropriate supportive housing options (Federal Task Force on Homelessness and Severe Mental Illness, 1992). However, many mentally ill homeless people are unable to obtain access to supportive housing and/or other treatment services. The mental health support services most needed include case management, housing, and treatment. Addiction Disorders: The relationship between addiction and homelessness is complex and controversial. While rates of alcohol and drug abuse are disproportionately high among the homeless population, the increase in homelessness over the past two decades cannot be explained by addiction alone. Many people who are addicted to alcohol and drugs never become homeless, but people who are poor and addicted are clearly at increased risk of homelessness. During the 1980s, competition for increasingly scarce low-income housing grew so intense that those with disabilities such as addiction and mental illness were more likely to lose out and find themselves on the streets. The loss of SRO housing, a source of stability for many poor people suffering from addiction and/or mental illness, was a major factor in increased homelessness in many communities. Addiction does increase the risk of displacement for the precariously housed; in the absence of appropriate treatment, it may doom one's chances of getting housing once on the streets. Homeless people often face insurmountable barriers to obtaining health care, including addictive disorder treatment services and recovery supports. The following are among the obstacles to treatment for homeless persons: lack of health insurance; lack of documentation; waiting lists; scheduling difficulties; daily contact requirements; lack of transportation; ineffective treatment methods; lack of supportive services; and cultural insensitivity. An in-depth study of 13 communities across the nation revealed service gaps in every community in at least one stage of the treatment and recovery continuum for homeless people (National Coalition for the Homeless, 1998). Homelessness results from a complex set of circumstances which require people to choose between food, shelter, and other basic needs. Only a concerted effort to ensure jobs that pay a living wage, adequate support for those who cannot work, affordable housing, and access to health care will bring an end to homelessness.